As we are about to head off on a family holiday for a couple of weeks, I have managed to squeeze in a few more cards from the Online card class. This card was one of the inking techniques from Day 7 cards with reverse stamps, where JJ Bolton encouraged us to think outside the box with our stamps and use the back of a clear stamp for a solid image if we don't have a stamp that will do the trick. Here I have used a Kaisercraft stamp from the pack your bags collection to stamp the bauble colour and then white embossed with the snowflake image from the free HOTP Enchanted Christmas collection that came with the Simply Cards magazine last month. The greeting is and added club member freebie from The Stamps of Life. Making some time to play and get a card a day made is actually quite a challenge for me considering I am working from my stash and have to work around ways to create a card with things I don't own. 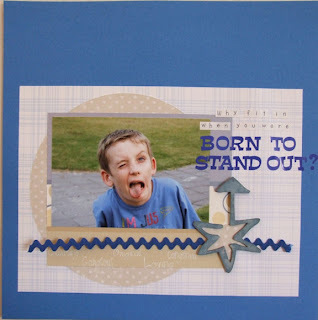 This first card is a design from Jennifer McQuire where she showed us how to make a window card and stamp with a background stamp over all the layers. 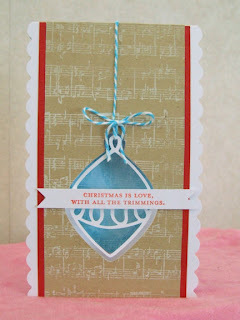 I didn't have a background stamp but I played with the Kaisercraft music background just stamping several times. 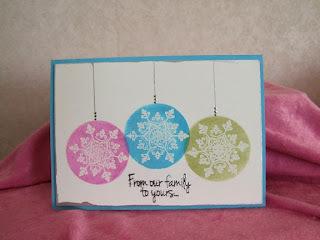 The bauble is from the Gingerbread Cricut cartridge which I have not long ago bought and the card, and front are cut using the Cricut Craft Room to design and then the edges of the card base are carefully done with my Fiskars Scalloped edge border punch. 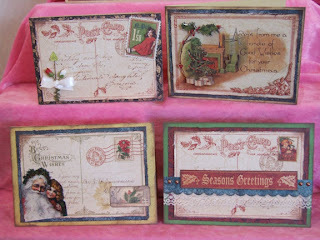 Greeting from the Stampin' Up Contempo Christmas set. In recent weeks I have been busy with life.... My eldest sister visited with our family from Adelaide and we spent a lot of our spare time showing her around Perth. The boys have been on school holidays and whilst I have been working 3 mornings a week, Dad has stayed home to look after the boys and take a well earned holiday break. Mojo has been absent so I have done very little of interest in the crafting arena for the month. I did get a new stamp set out that I bought earlier in the year and actually put it to use. I just stamped a number of images without any plans on how to use them and then decided to put them to use when I had time to play. 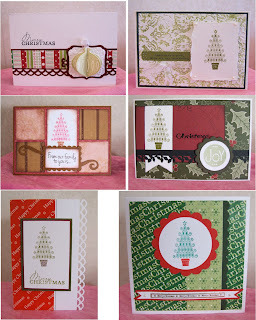 This is the Contempo Christmas set from Stampin' Up which I have teamed with some other greetings from The Stamps of Life - several sets and some rub-ons and sticker greetings also. 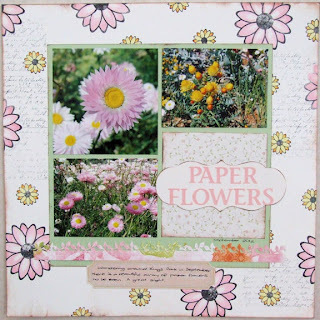 The top left is a lift of a card by Darleen Adamo and the rest are just playing around with old scraps and magazine freebies. Sorry..... word verification has gone back on. Hi all, I have had to turn back on my word verification for comments as I am having too many issues with Spam comments. I hate it myself and I don't like to have it on but unfortunately I need to bring it back. I hope it won't put you off of leaving me some love. Back to share when I have done some more crafting.... been busy with my big Sister here visiting me. It's been fun sharing some of Perth with her. 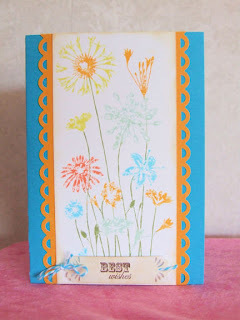 Just a couple of shares playing with my new Hero Arts Wildflowers stamp. The first if done with Whispers markers and of course uses some Fiskars border punches: Apron Lace and Starburst. 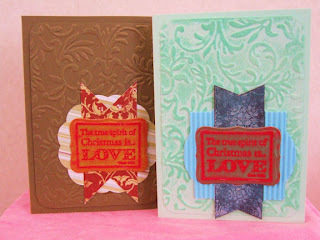 The second card is white embossed and uses the resist technique with tempting turquoise Stampin' Up ink. The label is a Criut cut from the Storybook cartridge and the butterfly is a really old stamp from Paper Pleasure Plus who are no longer in business. The butterfly is coloured with twinkling H2O's and looks really pretty IRL. Just a few more shares from the last couple of weeks. I have been trying to catch up with a few more of Heather's sketches but it is a long slow process now that X Factor is back on. 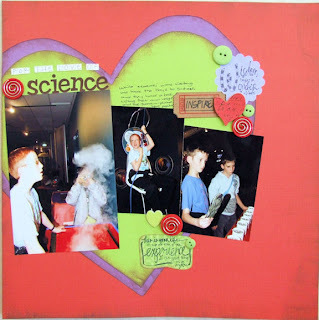 I truly should not be roped into watching so much TV but alas I do need to just sit and do nothing sometimes when the brain becomes foggy.﻿ This is MWS 28-12 with photos of the boys at Scitech. We took Masaki there when he was visiting and the boys loved it. They always enjoy interactive science shows. In my last post I told you to join us at Home and Scrapped for the Cybercrop in August. Here are the layouts that I completed. I asked everyone to choose a quote from the list and make a layout using it as the title or in the journaling. I kept my example very simple and chose a quote that I really like and suits Keelan down to the ground. Next I gave them a magazine cover that was very busy and asked all to gain inspiration for a layout from it. Above is my example using lots of paint splashes and designs from the inspiration. Angie wanted us to create a layout using fabric in our background and include at least three handmade embellishments. The butterfly using the Fiskars funky heart punch, the two grey based flowers and the hat pin were my handmades and apart from the background cardstock therest is pretty much fabric. If you get a chance to scrap this weekend, come drop by Home and Scrapped for a Cybercrop to get your creative juices flowing. Angie and I are running it this weeked and we have a couple of interesting challenges for you to play along with. I've been continuing to make my Christmas cards and bought a kit the other week from Scrapbooks from the Heart in Canning Vale with some lovely Graphic 45 papers in it and some designs by a team member. 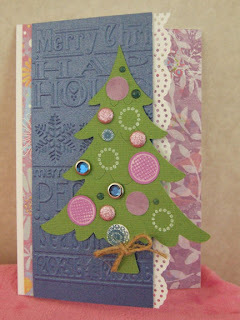 I started with the cards from the kit and with the little bits left over made a couple of extras of my own. There was lots of fussy cutting to be done so was glad when I finally finished them. The end results are lovely though even if I do have to admit to it after all the cussing. The two cards at the bottom row of the first photo are my own design and the other 6 were the kit design.